It’s a poor substitute for a billy cart, I know, but at least it means he can participate. He starts spouting ideas, in typical Munchkin fashion. “A rocket would be good, Mum.” I try to conceal my excitement… he might just tackle a creative project yet! At home, he scours the collection of craft materials, finally pulling out two cheap paper Chinese lanterns, left over from a long-distant party. “Yep! I don’t really like craft projects.” No truer words were ever spoken. With that sorted, and the rest of the afternoon still before him, he wanders aimlessly about the studio until he notices the last of the Story Starter cards which I have been splitting up for recycling. I know this is asked mostly for my benefit (we have only played together a few times before), and his words completely erase my disappointment about the whole bike-decorating non-event. “It’s OK Sweetie,” I reassure him, “We can play any time, I still have my own set.” I go over to my hidden stash and pull out the Kid Stuff pack. We laugh at his silly made up stories (“That’s a made-up one, Mum!”). We reminisce about holidays and adventures. We share a poignant moment or two, as we discuss how much we miss Grandma and Grandad now they have moved to Queensland, or how we haven’t gotten our chooks yet. We hug. We just talk. It is the most fun we have had together in ages! Every week it gets easier to let Leaf go… but occasionally these bittersweet moments still tug at my heartstrings. The thank you email and photos from a “friend of a friend” of her kids with their dirtgirl scrapbooks. The odd mention by a friend about how much her daughter is enjoying her journal. The occasional request for donations to worthy charities. I know I still have so much left to do… not just for my Munchkin, but loads of other kids (and adults) too. 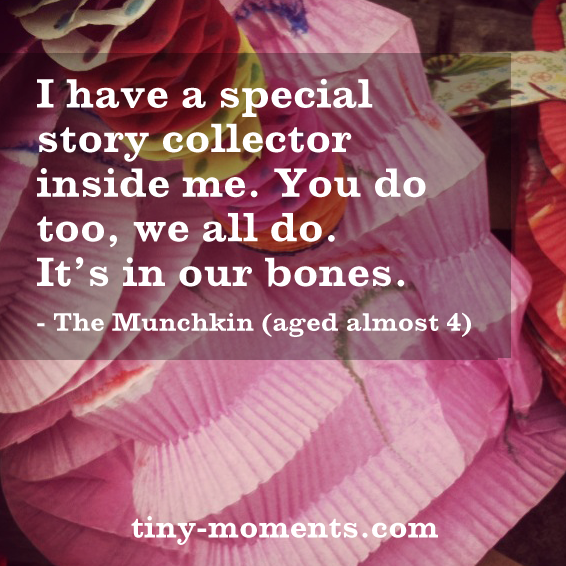 For my gorgeous storytelling, craft-avoiding Munchkin… Today I am grateful. I’m unlikely to get wet. – Unknown (a vaguely remembered childhood poem). It is hardly a comforting thought as I notice the shabby state of said umbrella. For starters, it’s one of those teeny, tiny hiking ones, and this is one hell of a thunderstorm! It also has at least one broken spoke, and holes… yep, right above my head. Undeterred, I set out on my forest walk anyway. It will be an adventure! There really is something about being in a rainforest in the rain. Somehow, the rain adds a dimension and intensity that just isn’t there at other times. It is stunningly beautiful. Overhead, thunder booms and crashes. It echoes through the tall trees – a cathedral of nature. Spine tingling stuff! Briefly, my thoughts drift to the Lightning Room at Scienceworks! But I soon decide that being surrounded by thousands of treetops, 60 metres above, as I am now, I would have to be SERIOUSLY unlucky! Then a scuttling noise beside the path grabs my attention. An echidna is snuffling through the undergrowth, totally unperturbed by my presence. Obviously dinner is far more interesting. I keep walking, avoiding the rapidly growing puddles as best I can. The rain pelts down harder. And then suddenly, like any good rainforest shower, it is over and the sun emerges. As I walk back to the car, I notice the giant mountain ashes have foam streaming down them. One after the other – Magic Faraway Trees, complete with their own Dame Washalots. I am wet through, but I don’t care. Instead, I do a little happy dance. For the forest, the rain and my totally inadequate umbrella… Today I am grateful. Doesn’t every kid dream of being an Olympic Champion? Inspired by the Sochi Winter Games, the Munchkin has invented a new sport – Backyard Luge. I must say, I have been quite impressed by his thorough research. 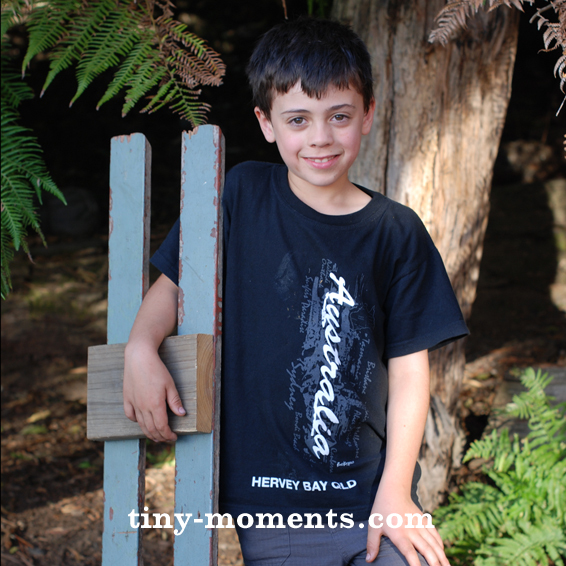 He has spent a great deal of time and effort perfecting the design of his luge, with a little help from his Dad, (is there anything decking boards cannot do?) I am delighted to say that safety has been a priority. While I have my doubts about the effectiveness of a broom as a crash test dummy, the Munchkin has certainly given it (and Teddy) a workout! Finding the fastest run, amongst a multitude of options around our grounds, has also been an important exercise. It seems the ideal run requires a good balance between slope, grass and steps! Luckily we have a multitude of all three. There have been times when I’ve had to take a deep breath and just let him go. Yes, he may end up with a minor injury, but with a top speed of about 5 metres per minute, it’s worth remembering that backyard luge is not THAT dangerous. When you add up the lessons in engineering, carpentry, physics and OH&S, let alone the laughs, it seems we’re on a winner! And the gold medallist in Backyard Luge is… The Munchkin!